Received July 31, 2018; Revised August 9, 2018; Accepted August 9, 2018. Rice grain quality is usually observed by its chalkiness and is affected by genetic effects of endosperm, cytoplasm and maternal plant. Controlling the chalkiness in rice can be a very challenging task because it is affected by genotype and environmental factors. 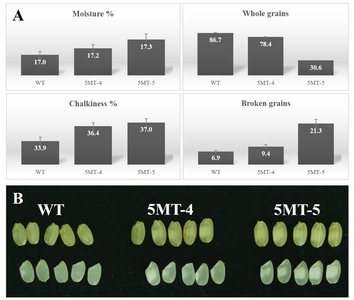 The present study aimed to introduce 5-methyl tryptophan (5MT) resistance from the 5MT resistant mutants into Samgwang, a high grain and eating quality Korean variety by introgression of, resulting to elevated tryptophan content in grains. The progenies generated from single crosses of two different cross combinations were phenotyped based on agronomic traits and by 5MT growth inhibition test. Through direct PCR sequencing, the inheritance of single base mutation (F124V) in OsASA was selected among the progenies. The latter generations were used to analyze the grain and eating quality of the selected lines. Inbred lines (S4-10, S4-28, and S5-11) carrying the point mutation in OsASA and with reduced chalkiness plus good eating qualities were successfully generated. Tryptophan content in the milled grains of the selected lines showed 2 – 4 times higher (mg/100 mg) than the maternal parent. The three selected lines, S4-10, S4-28, and S5-11, were later renamed as GolSam-1, GolSam-2, and GolSam-3 respectively. The main objective of crop scientists is to help supply enough food for our growing population. Today, a lot of the food available in the market doesn’t supply enough nutrients we need. It is important to provide highly nutritious food with good grain and eating quality in the market. Preservation of nutrients in rice grains adds to its value. Bio fortification of rice is exemplified by famous studies like golden rice (Ye et al. 2000) and iron-fortified rice (Goto et al. 1999; Cho et al. 2009). However, even if the rice grain has an added value and it has bad grain appearance, it becomes undesirable for consumers. This is the case in mutant rice lines with high-level tryptophan content. This paper tackles on the development of high-level tryptophan rice with good eating and grain quality. Tryptophan (Trp) is one of the essential amino acids needed by our body along with histidine, threonine, valine, methionine, isoleucine, leucine, phenylalanine, and lysine (Yang et al. 2016). As a review of concept, essential amino acids are those that cannot be synthesized by living organism but needed for normal functioning, so these amino acids need to come from our diet. Dietary tryptophan that goes in the liver proceeds to one of the two basic metabolic pathways. First, it is used for protein synthesis and other functions by cells throughout the body and second, it can be degraded in the liver through a series of metabolic steps known collectively as the kynurenine pathway (Moffett and Namboodiri 2003). In the nervous system and gut, tryptophan is needed as a substrate to synthesize serotonin. In the pineal gland, it is required to produce melatonin. Also, when niacin content in the diet is insufficient for metabolic requirements, tryptophan is necessary for the synthesis of the essential cellular cofactor, nicotinamide adenine dinucleotide (NAD+) (Moffett and Namboodiri 2003). Collectively, tryptophan is important for the production of bioactive metabolites and regulation of serotonin and melatonin. Lack of enough tryptophan can increase the risk of pellagra disease, a type of nutrient deficiency disease that may cause dermatitis, dementia, or diarrhea (Hegyi et al. 2004). Synthetic tryptophan is expensive due to the relatively low efficiency of industrial production (Ishihara et al. 2007). Thus, Trp fortification in rice for human food can contribute great health benefits. Anthranilate synthase (AS) converts the substrate of tryptophan synthesis, chorismate to anthranilate, the first reaction in tryptophan biosynthesis (Ishikawa et al. 2003). AS has alpha and beta subunits, the alpha subunit is important for feedback inhibition of the enzyme by tryptophan, thus, AS has a key role in regulating tryptophan biosynthesis (Ishikawa et al. 2003). In previous studies, ethylmethane sulfonate (EMS) treated rice generated mutant rice with mutation in AS, resulting in resistance to growth inhibition by tryptophan analog like 5-methyl tryptophan (5MT). 5MT may fit into an allosteric site AS, the key feedback player in the tryptophan biosynthetic branch of the shikimate pathway, in the same way as tryptophan (Kim et al. 2004). A sensitive enzyme fails to recognize completely between tryptophan and 5MT. The cell thus responds to 5MT by inhibiting further tryptophan synthesis. In addition, the 5MT is unable to replace the tryptophan in cellular protein synthesis, therefore arresting cellular growth. However, tryptophan over-synthesizing mutants are resistant to growth inhibition (Kim et al. 2007). For the present study, we further characterized the high-level tryptophan mutant rice by evaluating their eating and grain qualities. The rice mutants were found to have a low eating and grain quality. To develop rice line with high tryptophan content and good grain and eating quality, Samgwang, a good grain and eating quality Korean cultivar was crossed with two high-level tryptophan rice lines to introduce the point mutation in OsASA, resulting in 5MT resistance. Inbred lines (S4-10, S4-28, and S5-11) carrying the point mutation in OsASA and with reduced chalkiness plus good eating qualities were successfully generated. Dehulled mature seeds were surfaced sterilized by washing once with 70% ethanol for five minutes and washed twice with 2.5% sodium hypochlorite for ten minutes each. Seeds were then washed-rinse several times using sterile distilled water. Seeds were then inoculated in Murashige and Skoog (MS) medium containing 50 μM 5-Methyl-DL-tryptophan (M0534 Sigma) and grown for 10 days at 30°C under constant light. PCR was performed using the primer set, Fw: GGGGA AGCCAGAGGCAAG Rv: CCTGGGGATCTGCATAG GAT, flanking the F124V point mutation. Direct sequencing of PCR products was applied and aligned with Multiple sequence alignment (Corpet 1988). Leaves of 2-week-old seedlings grown in half strength MS vitamins with 5MT were grounded using liquid nitrogen with a mortar and pestle and suspended in one volume of ice-cold anthranilate synthase (AS) extraction buffer and 2 mg polyvinylpolypyrrolidone per 1 g weight of fresh leaves. The solution was centrifuged for 15 minutes at 30,000 × g twice. One volume of the collected supernatant was mixed with two volumes of saturated ammonium sulphate, and centrifuged. The resulting pellet was then re-dissolved in 500 μL AS extraction buffer for later use in the AS assay. AS activity was measured by the chorismate dependent production of anthranilate. The re-suspended ammonium sulphate pellet was combined with 1.5 mL of AS buffer 2 and 200 μL of a substrate solution. Anthranilate levels were quantified fluorometrically at 340 nm (excitation) and 400 nm (emission) using an Aminco-Bowman spectrofluorimeter (SLM-Aminco, Urbana, IL). Anthranilate formation was followed by continuous fluorometric monitoring of the reaction mixture at 30°C, with the stepwise addition of small volumes (1, 10, 100, 250, 500 and 1000 mM) of tryptophan stock solution (5 mM). The reaction was allowed to stabilize between each addition. Quantification of relative mRNA expression of OsASA in crossing parents and selected progenies was done. Leaf samples were collected from two-week old seedlings and crude extraction method of RNA was employed by using RNAiso Plus (Total RNA extraction reagent). We used ReverTra Ace ® qPCR RT master mix with gDNA remover for cDNA synthesis. For qRT-PCR, the supermix we used was iQ TM SYBR ® Green in Bio-Rad real time PCR instrument. β-tubulin gene was used as internal control. After harvest, rice grains were oven dried at 55°C for three days. After ensuring that the grains have around 14% moisture content, grains were hulled through a rice huller to make brown rice. Brown rice samples were then polished to 90% by a polishing machine (MC-90A, Toyoseiki). Fifteen grams of polished rice samples were weighed and milled through a 100-mesh screen by Cyclotec Sample Mill (Foss North America [Tecator] No.1093-003). Ground samples were used for viscosity test, amylose content and amino acid content analyses (Lee et al. 2014). Grain selector separated broken rice from the whole grains. Grains selected were used for further analysis. The grain inspector machine measures whole grains, brokenness, chalky grains, and damaged grains. The Infratec Grain Analyzer measures moisture, protein, amylose, and whiteness of the grains. To measure the viscosity of rice samples in this study, the Rapid Visco Analyzer (RVA) Japanese Rice method was used. This method was developed by The Food Agency in Japan, it provides a long profile to better differentiate rice samples of similar quality. A canister was filled with 25.0 mL of distilled water. Selected ground rice samples were measured to three grams and transferred to the canister. Into the canister, the paddle was placed properly and the canister was inserted into the RVA instrument. All viscosity parameters were measured in Rapid Visco Units (RVU) with three replications for each sample. For palatability, two sets of machines were used, the first one was Satake Rice Taste Analyzer requiring about 10 grams of milled rice and the other machine was the TOYO taste meter system (MB-90A and MA-90B, Japan) which uses 33 g of milled rice per sample (Lee et al. 2014). Agronomic traits of the three parents used and the progenies were measured based on their field performance. The data gathered were in three replications and analyzed for significant difference, measurements followed the Standard Evaluation System (SES) for rice. For this data, significant tests were performed using Duncan Multiple Range Test. Two 5MT resistant lines generated by EMS mutation were characterized and evaluated using molecular and phenotype analysis. In this paper, the two high-level tryptophan mutant lines were referred as 5MT-4 and 5MT-5. The wildtype (WT) or background of these lines is Donganbyeo, a widely grown variety in Korea. The point of interest in this study is the tryptophan content of the generated inbred lines and the grain and eating qualities. First, seeds were selected by growing in half strength MS media with 50 μM of 5-methyl-tryptophan, an analog of tryptophan that inhibits the synthesis of anthranilate compounds that are the first steps in the biosynthesis of tryptophan. Fig. 1A shows the well-developed shoots and roots of 5MT-4 and 5MT-5 seedlings compared to its WT. This insensitivity to tryptophan analog is caused by a single base change resulting to amino acid change F124V in anthranilate synthase (AS) protein (LOC_Os03g15780) (Fig. 1B). AS is the enzyme that converts the tryptophan precursor chorismate to anthranilate, and it is susceptible to feedback inhibition (Fig. 2A). To determine if there was a change in AS, its enzyme activity should have a difference between the WT and the two mutant lines. AS activity was measured in different concentrations of tryptophan (0, 10, 100, 250, 500, and 1000 μM) with 10 mM glutamine and 100 μM chorismate as substrates. Fig. 2B shows the increasing trend of AS from the extracts of two high tryptophan lines as the tryptophan concentration increased, 5MT-5 showed 1.5 times higher activity compared to 5MT-4 at the end. In contrast, their wildtype showed very low activity. The amount of tryptophan in mature seeds of 5MT-4 and 5MT-5 lines was the highly desirable characteristic in the said mutant lines. These lines showed stable reaction in 5MT containing medium in every generation. The tryptophan content reveals as much as 30-fold change in pmol and 5-fold change in mg/100 mg. However, in this study, high-level tryptophan mutant rice lines were found to have a low grain and eating quality. Limited studies showed the grain and eating quality of high-level tryptophan rice, most studies have characterized the molecular aspect of AS which causes the insensitivity of high-level tryptophan rice in tryptophan analogs (Niyogi and Fink 1992; Tozawa et al. 2001; Ishikawa et al. 2003). To quantify the grain quality, moisture content, whole grain, chalkiness, and broken grains were measured in milled high-level tryptophan lines. The two high tryptophan rice lines have many damaged grains and were very chalky (Fig. 3A) despite the standard moisture content. In Fig. 3B the grain phenotype of WT Donganbyeo, 5MT-4 and 5MT-5 was shown. Based on the initial results on average taste parameters (perception, hardness, stickiness, balance and taste), the wildtype showed higher values than the high tryptophan rice lines. To developed inbred lines having high tryptophan content and good grain and eating quality, 5MT-4 and 5MT-5 as donors of 5MT resistant gene were crossed to Samgwang variety, which is popular as high quality rice variety in Korea. Two cross combinations were used to increase the probability of generating rice lines with high tryptophan and good eating and grain quality (Fig. 4). Each selection focuses on screening the progenies in agar medium containing 50 μM 5-methyl-tryptophan. Lines showing well grown shoots and roots after 10-14 days (Fig. 5A) were forwarded in the next generation. Furthermore, the introgression of mutation was confirmed by sequencing the target sequence of ASA2 gene in the progenies. The single point mutation (F124V) found in 5MT-4 and 5MT-5 was successfully introgressed in the progenies generated from the two cross combinations (Fig. 5B). Further, the relative mRNA expression of OsASA encoding anthranilate synthase was determined. Since anthranilate synthase is the key regulator of tryptophan biosynthesis, it will be helpful to know the relative expression of OsASA gene between parents and selected high-level tryptophan lines. Samgwang, having no point mutation showed relatively higher expression compared to the high-level tryptophan lines carrying the point mutation (Fig. 5C). After screening progenies via selection in 5MT containing media and good phenotype selection in the field, the seeds in F6 generation were harvested in bulk for each line and used for grain and eating quality experiments. The most notable characteristic of a bad grain quality were the brokenness and chalkiness, which was observed in 5MT-4 and 5MT-5 grains. As expected, reduced chalkiness percentage were observed from the lines selected in F6 generation (Fig. 6A). Grain phenotypes of the selected breeding lines were exemplary in terms of no chalkiness in grains (Fig. 6B). The progenies showed low level of whiteness showing clearness compared to the high-level tryptophan parents thereby creating a good grain appearance. This phenotype was supported for good grain and eating quality by the quantitative data on protein content, viscosity, amylose content (AC), and palatability. To measure the general nutritional content of the generated lines, protein content was determined and found out that the most progenies are significantly lower than their parents, 5MT4 and 5MT5, which was expected for improving the eating and grain quality of new rice lines (Fig. 7A). For the final viscosity, S5-3, showed the highest significant difference among other progenies (Fig. 7B). In terms of amylose content, all breeding lines showed lower than 20% AC but 5MT4 and 5MT5 showed higher amylose contents than F6 progenies except for S5-3 line (Fig. 7C). For palatability, lines S4-9, S4-10, S4-28, S5-7, and S5-11 showed higher values compared to their maternal parent Samgwang (Fig. 7D). Rice powder samples were used to measure the amino acid contents of the selected F6 lines along with their parents. All twenty amino acid contents are presented individually in Table 1. For our interest, not all F6 lines inherited the high-level tryptophan, however, three promising lines, namely, S4-10, S4-28 and S5-11, all from Samgwang background have significantly elevated tryptophan content in their mature grains. These three selected lines were renamed as GolSam-1, GolSam-2 and GolSam-3 for possible new candidate varieties of rice. Remarkably, other amino acids in other F6 lines showed significant higher content compare to maternal parent Samgwang. Finally, we considered the agronomic traits and yield characteristics of the selected lines by pairwise comparison and found out that no significant changes were found (Table 2). The selected lines can be used further as materials for studying transcriptome expression of agronomically important genes and/or for varietal candidate evaluation. The development of good grain quality lines with 5MT resistance represented by the GolSam series led to a new source of high tryptophan rice. The potential benefits of GolSam series to farmers are the improvement in nutrition and higher quality of rice. In this study we showed the development of high-level tryptophan rice in terms of grain and eating quality by making crosses between the high-level tryptophan rice with popular Korean variety having good grain and high eating quality. Previous studies have characterized the insensitivity of different crops in 5-methyltryptophan (Lee and Kameya 1991; Kang and Kameya 1993; Tam et al. 1995; Matsuda et al. 2005) and described the genes regulating anthranilate synthase (Niyogi and Fink 1992; Tozawa et al. 2001; Hanafy et al. 2006; Chun et al. 2012). Part of our study described the growth and selection of high tryptophan rice (5MT-4 and 5MT-5) in 5-methyltryptophan (5MT), a tryptophan analog which would inhibit the production of tryptophan because 5MT can fit to the allosteric site of AS. AS is the first-step enzyme in the tryptophan pathway. But 5MT-4 and 5MT-5 contain F124V mutation in ASA2 (anthranilate synthase gene2) (Fig. 1B) that gives its insensitivity to 5MT. Previous reports showed D323N in ASA1 (Tozawa et al. 2001) and S126F/L530D, Y367A/ L530D, and A369L/L530D in ASA2 (Kanno et al. 2005) in rice also allows insensitivity to tryptophan. We showed here that 5MT-4 and 5MT-5 have high-level of tryptophan content but the grain quality is low and in effect, the eating quality turns out low as well. Some studies that showed the importance of sensory evaluation in fortified rice is on the development of a simple procedure to fortify milled rice with calcium, the end product is calcium-fortified cooked rice with harder texture suitable for canned rice products (Lee et al. 1995) and that of Moretti et al. (2005) where they developed iron-fortified rice with comparable sensory characteristics to natural rice by using iron compounds of high bioavailability. So far, there are no studies that evaluated the grain and eating quality of high-level tryptophan rice. To generate lines with improved grain and eating quality and high-level tryptophan, conventional breeding was employed. The maternal parent for high grain quality and high eating quality was Samgwang. Samgwang was recommended in Gangrung and Gangwon provinces based on high yield, quality and suitability (Jeong et al. 2015). A portion of ASA2 was sequenced using the DNAs of selected lines and confirmed the introgression of a single point mutation (F124V). The initial selection was based from the growth of seeds in 5MT containing medium. Only those seeds that grew well in the media were advanced in the field. Plants were selected in the field based on their agronomic and yield performance. To enable stable response in 5MT medium and uniform phenotype, we advanced all populations selected up to F6 generation (Fig. 4). Using bulk harvested F6 seeds, we performed grain and eating quality tests in order for us to finally select lines with improved quality. Our analysis has shown reduced chalkiness in the grains (Fig. 6) and improved in other parameters like palatability, viscosity, amylose content and whiteness became like Samgwang. We used Samgwang as high-quality variety control (Fig. 7). For palatability, since we used TOYO taste meter we can only described the quantitative values of the changes in the glossiness of the cooked rice. Among the F6 lines used for analysis, three lines were significantly higher than those of their parents and the rest are relatively the same values. Molecular structural mechanism was suggested as a new tool to select cultivars with desirable palatability. A cultivar which leaches more amylopectin with shorter amylopectin chains and bigger molecular size would be sticky after cooking. On the other hand, a cultivar which leaches more amylose should be less sticky but have a harder texture (Li et al. 2017). In terms of viscosity, which also indicates rice quality, our data showed low variability among the parents and progenies except for three F6 lines that have the highest final viscosity. No correlation is shown in our data between viscosity and amylose content. In other studies, rapid visco analysis parameters namely, pasting onset and peak temperature correlated positively with amylose content in native rice starches (Li et al. 2008) and is also similar for maize starches (Lim et al. 2002). The ideal amylose content in Korean rice is less than 20%, here, several high-level tryptophan rice lines were not significantly different from Samgwang variety. We also tested the protein content and found out that the generated F6 lines have relatively lower protein content than 5MT-4 and 5MT-5 parents. Interestingly, we have obtained three F6 lines with high-level of tryptophan from Samgwang background. Since we focused on increasing the tryptophan content in mature grains, we looked if there is an effect in the regulation of AS in tryptophan biosynthesis pathway. We measured the mRNA expression of OsASA gene encoding AS and found out that the trend of expression this gene was lower in high-level tryptophan lines than Samgwang. This suggests that the single point mutation that also causes alteration in amino acid sequence results in low mRNA expression. Regarding about the roles of the two subunits if OsASA, ASA2 expression is the same in many tissues and can be induced by a chitin heptamer, suggesting a role in secondary metabolism while ASA1 has higher expression in the panicles and it is important in Trp regulation (Tozawa et al. 2001). Different roles are also suggested in Escherichia coli, when TrpR and tnaA genes were knocked out, the tryptophan production increased up to 20-folds (Yu et al. 2008). Finally, this study has shown the development of high tryptophan rice with improved grain and eating quality by using conventional breeding. Through the two cross combinations used, a large selection of population was generated and compared the lines among the three parents. Although this method was proven useful, our selection may have been less laborious if there was a developed marker for F124V point mutation. Another impediment of our study is the selection from the early generation based on grain and eating quality because of the need for large amount of seeds for analysis. Nevertheless, after several generations of advancing in field condition and analysis, we were able to produce lines with high-level tryptophan with good eating and grain qualities. Overall, the GolSam series with high-level tryptophan and good grain and eating quality can be candidates for new variety testing or can be used for yield improvement or development with resistance to various stresses. In this way, GolSam can contribute as good source of high-level tryptophan which can enable farmers to get higher income. This research was supported by the Next-Generation BioGreen 21 Program (Plant Molecular Breeding Center, No. PJ013207), Rural Development Administration, Republic of Korea. Fig. 1. Phenotype of rice grown in 5MT containing media and partial amino acid sequence of anthranilate synthase. (A) Various lines were screened by growing seeds in half strength Murashige and Skoog (MS) media with 50 μM 5-methyl-tryptophan. The wildtype Donganbyeo have no well-developed roots while the two high-level tryptophan mutant lines 5MT-4 and 5MT-5 showed well grown shoots and roots. (B) Sequence alignment of anthranilate synthase (AS) (LOC_Os03g15780.1) against the two mutant lines, where mutation occurs in F124V (F [TTC] to V [GTC]). Fig. 2. Biosynthetic pathway of tryptophan in plants and AS activity. (A) The curved line from Trp to AS indicates negative feedback regulation. 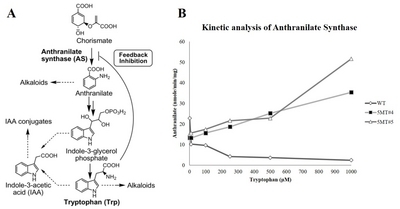 (B) Feedback inhibition of anthranilate synthase activity by tryptophan. Anthranilate synthase activity in the presence of tryptophan (0, 10, 100, 250, 500, and 1000 μM) with 10 mM glutamine and 100 μM chorismate as substrates. Fig. 3. Grain and eating quality of 5MT resistant lines. (A) Evaluation of grain quality traits in high-level tryptophan mutant rice along with the wildtype. (B) Physical grain appearance, the first row is unpolished rice while the second row is milled rice. Fig. 4. Diagram of breeding history. A single cross descent was used to introduce the single point mutation from mutant rice to Korean variety with good eating and grain quality. Method of selection in each generation is shown. A total of two cross combinations were used, namely Samgwang X 5MT-4 and Samgwang X 5MT-5. Breeding history of Samgwang is also shown as derivatives from other rice cultivars. Fig. 5. Phenotypic response to 5MT containing media, ASA2 gene sequence alignment and relative mRNA expression. (A) Responses of crossing parents and F5 progenies in 5MT inhibition media. (B) Sequence alignment of ASA2 gene in rice, crossing parents and progenies (S5-11 and S4-28) DNA sequence giving the mutation F124V (F [TTC] to V [GTC]). (C) Relative mRNA expression of OsASA between Samgwang, 5MT line and two selected progenies. As shown, those lines carrying the point mutation showed relatively lower expression of OsASA compared to Samgwang with no mutation. Fig. 6. 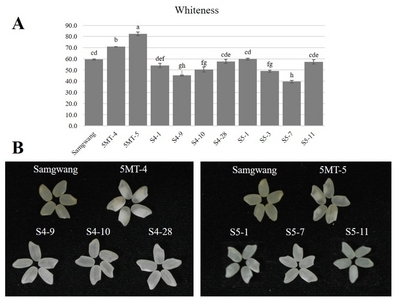 Comparison of grain quality appearance of parents (Samgwang, 5MT-4, and 5MT-5) and three selected lines in F6 generation from each cross combination. (A) Whiteness level of milled grains of parents and the breeding lines. (B) Grain phenotype of polished grains of parents and selected breeding lines. Fig. 7. Eating quality measurements of three parents used in crossing (Samgwang, 5MT-4, and 5MT-5) and their selected progenies in F6 generation. Each histogram shows the comparison of parents among their progenies based on some of the important eating quality measures (A) protein – for nutritional value present in grains (B) viscosity – as a means of measuring how viscous the rice starch (C) amylose content – tells about the firmness and stickiness of rice and (D) palatability – quantitative measurement of cooked rice taste. Amino acid content of Samgwang, 5MT resistant lines, and selected breeding lines (mg/100 mg). Agronomic traits of parents and F5 progenies. Yield was calculated based on 200,000 plants per hectare. Cho, YG, Kim, HK, Choi, JS, Jung, YJ, and Kang, KK (2009). Iron fortification of grains by introducing a recombinant of ferritin with seed promoters in rice. J Plant Biotechnol. 36, 87-95. Corpet, F (1988). Multiple sequence alignment with hierarchical clustering. Nucleic Acids Res. 16, 10881-10890. Chun, JB, Ha, BK, Jang, DS, Song, M, Lee, KJ, and Kim, JB (2012). Identification of mutations in OASA1 gene from a gamma-irradiated rice mutant population. Plant Breed. 131, 276-281. Goto, F, Yoshihara, T, Shigemoto, N, Toki, S, and Takaiwa, F (1999). Iron fortification of rice seed by the soybean ferritin gene. Nat Biotechnol. 17, 282-286. Hanafy, MS, Rahman, SM, Khalafalla, MM, El-Shemy, HA, Nakamoto, Y, and Ishimoto, M (2006). Accumulation of free tryptophan in azuki bean (Vigna angularis) induced by expression of a gene (OASA1D) for a modified α-subunit of rice anthranilate synthase. Plant Sci. 171, 670-676. Hegyi, J, Schwartz, RA, and Hegyi, V (2004). Pellagra: dermatitis, dementia, and diarrhea. Int J Dermatol. 43, 1-5. Ishihara, A, Matsuda, F, Miyagawa, H, and Wakasa, K (2007). Metabolomics for metabolically manipulated plants: effects of tryptophan overproduction. Metabolomics. 3, 319-334. Ishikawa, Y, Park, JH, Kisaka, H, Lee, HY, Kanno, A, and Kameya, T (2003). 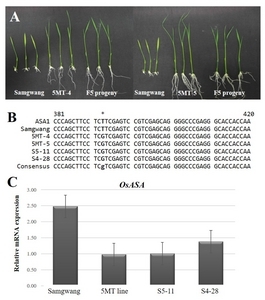 A 5-methyltryptophan resistant mutant of rice has an altered regulation of anthranilate synthase gene expression. Plant Sci. 164, 1037-1045. Jeong, JS, Goh, BD, Ham, JK, Choi, KJ, and Yang, UH (2015). Comparison of yield and quality characteristics on mid-late maturing rice cultivars in major cultivation areas of Gangwon Province. Korean J Crop Sci. 60, 421-430. Kang, KK, and Kameya, T (1993). Selection and characterization of a 5-methyltryptophan resistant mutant in Zea mays L. Euphytica. 69, 95-101. Kanno, T, Komatsu, A, Kasai, K, Dubouzet, JG, Sakurai, M, and Ikejiri-Kanno, Y (2005). Structure-based in vitro engineering of the anthranilate synthase, a metabolic key enzyme in the plant tryptophan pathway. Plant Physiol. 138, 2260-2268. Kim, DS, Lee, IS, Jang, CS, Kang, SY, Song, HS, and Lee, YI (2004). Development of AFLP-derived STS markers for the selection of 5-methyltryptophan-resistant rice mutants. Plant Cell Rep. 23, 71-80. Kim, DS, Kim, JB, Lee, GJ, Kang, SY, Jang, CS, and Lee, SY (2007). Identification of expressed sequence tags from a cDNA library of 5-methyltryptophan resistant rice mutants. Journal of Radiation Industry. 1, 1-13. Lee, HJ, Jee, MG, Kim, JK, Nogoy, FMC, Niño, MC, and Yu, DA (2014). Modification of starch composition using RNAi targeting Soluble Starch Synthase I in Japonica rice. Plant Breed Biotech. 2, 301-312. Lee, HY, and Kameya, T (1991). Selection and characterization of a rice mutant resistant to 5-methyltryptophan. Theor Appl Genet. 82, 405-408. Lee, MH, Hettiarachchy, NS, McNew, RW, and Gnanasambandam, (1995). Physicochemical properties of calcium-fortified rice. Cereal Chem. 72, 352-355. Li, Y, Shoemaker, CF, Ma, J, Shen, X, and Zhong, F (2008). Paste viscosity of rice starches of different amylose content and carboxymethylcellulose formed by dry heating and the physical properties of their films. Food Chemistry. 109, 616-623. Li, H, Fitzgerald, MA, Prakash, S, Nicholson, TM, and Gilbert, RG (2017). The molecular structural features controlling stickiness in cooked rice, a major palatability determinant. Sci Rep. 7, 43713. Lim, ST, Han, JA, Lim, HS, and BeMiller, JN (2002). Modification of starch by dry heating with ionic gums. Cereal Chem. 79, 601-606. Matsuda, F, Yamada, T, Miyazawa, H, Miyagawa, H, and Wakasa, K (2005). 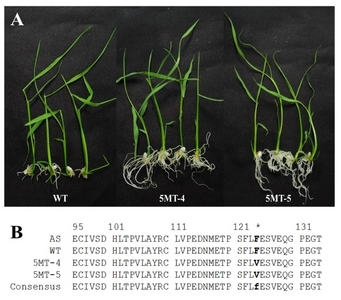 Characterization of tryptophan-overproducing potato transgenic for a mutant rice anthranilate synthase α-subunit gene (OASA1D). Planta. 222, 535-545. Moffett, JR, and Namboodiri, MA (2003). Tryptophan and the immune response. Immunol Cell Biol. 81, 247-265. Moretti, D, Lee, TC, Zimmermann, MB, Nuessli, J, and Hurrell, RF (2005). Development and evaluation of iron-fortified extruded rice grains. J Food Sci. 70, S330-S336. Niyogi, KK, and Fink, GR (1992). Two anthranilate synthase genes in Arabidopsis: defense-related regulation of the tryptophan pathway. Plant Cell. 4, 721-733. Tam, YY, Slovin, JP, and Cohen, JD (1995). Selection and characterization of [alpha]-methyltryptophan-resistant lines of Lemna gibba showing a rapid rate of indole-3-acetic acid turnover. Plant Physiol. 107, 77-85. Tozawa, Y, Hasegawa, H, Terakawa, T, and Wakasa, K (2001). Characterization of rice anthranilate synthase alpha-subunit genes OASA1 and OASA2: tryptophan accumulation in transgenic rice expressing mutant of OASA1. Plant Physiol. 126, 1493-1506. Yang, QQ, Zhang, CQ, Chan, ML, Zhao, DS, Chen, JZ, and Wang, Q (2016). Biofortifcation of rice with the essential amino acid lysine: molecular characterization, nutritional evaluation, and field performance. J Exp Bot. 67, 4285-4296. Ye, X, Al-Babili, S, Kloti, A, Zhang, J, Lucca, P, and Beyer, P (2000). Engineering the provitamin A (ß-carotene) biosynthetic pathway into (carotenoid-free) rice endosperm. Science. 287, 303-305. Yu, J, Wang, J, Li, J, Guo, C, Huang, Y, and Xu, Q (2008). Regulation of key enzymes in tryptophan biosynthesis pathway in Escherichia coli. Chinese journal of biotechnology. 24, 844-850.